Minnesota has experienced an extended Indian summer this year, with nearly two weeks of 70-plus degree temperatures and sunny skies. Since forecasters are predicting a snowy, tough winter, enjoy it while you can! As a result of the warm temperatures, some of perennials and annuals are still looking great. Here are three I’m especially pleased to see continue. Victoria Blue Salvia has been a star in the October garden. ‘Victoria Blue’ Salvia. I planted these after reading Terry Yockey’s profile of Donald Mitchell’s hummingbird garden in Red Wing. Mitchell is a big fan of blue and red salvias for their ability to bring in the hummers. I did not see any hummingbirds at these, though last week a large white-lined sphinx moth (sometimes called a hummingbird moth because of their resemblance to each other) fed on the plants for several minutes. Bees also seem to love them. The plants bloomed slightly late because of our cool spring, but they have continued to bloom with no sign of stopping. They also make a pretty backdrop to these white ‘Profusion’ zinnias. ‘Going Bananas’ daylily. This plant will be introduced widely in 2012. I got one to try through the Proven Winners plant trial program. 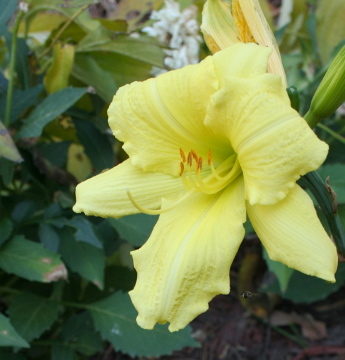 While many of my daylilies look sad and spent – and I’ve cut a few of them down, this creamy yellow plant is still going strong. If you see one in the nursery next year, give it a try. Autumn Joy sedum. Yes, Autumn Joy is almost a cliché in northern gardens, but there is a reason so many people love these hardy sedum. They grow vigorously and can flop if they get too tall. I cut this one back in mid-June, per advice from Don Engebretson. For awhile, I did not think it was going to work, but voila, it did and the plant is just the right size to support its lovely pinkish flowers. I’ll leave this up all winter to provide sculptural interest in the garden. What’s still blooming in your garden? « Hidden Gardens of Washington, D.C. 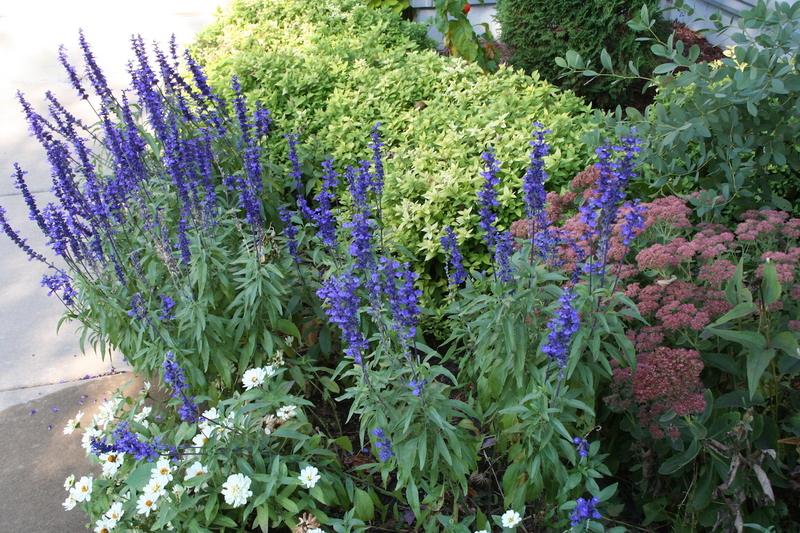 I love victoria blue salvia – I also have black & blue salvia & Wendy’s Wish salvia currently blooming (and yes, they are hummingbird magnets), they are one of my top 3 annuals along with lisanthus and the gem marigolds (tangerine, lemon & red). In fact all 3 of those are still blooming in my west central MN garden and if it wasn’t raining today I would head out to take photos for tomorrow’s blog post. I have already chopped down and cleaned up most of the perennials except for the mums in the backyard but those annuals just keep on blooming! The front gardens still have roses blooming as well as the autumn joy and there are a few stray clematis blossoms here and there. If weather permits I will try for photos tomorrow and post my remaining color because this great weather can’t last forever. Perennials: Mums, asters-the stalwarts I will always have for autumn; a late Solidago, last bloom of Rudbeckia triloba; shrub roses and hydrangeas. Oh, and monkshood just started. Annuals: zinnias still going, most pots still looking good, and a window box of bright pink petunias. And, of course, the wonderful swaying blooms of the grasses, plus colorful leaves blown about the yard. My favorite season. P.S. Just found my autumn crocus poking up yesterday-yeah!